This page details tips and tricks for cards in the game. Trashing is very important, and it is a good practice to begin trashing weaker cards early in the game. The best time to trash is when you have a Spell Book in play. If you have 3 or 4 Copper and the Spell Book, use your treasure to gain a spell, then trash as much copper as you can. This works well if you’ve already purchased a couple Silver and no longer require an abundance of Copper. REMINDER: Gaining a spell never counts against an action (buy, fight or trash). Exhausted pixels do not reset until your next turn (unless specified otherwise). It’s best to play spells after an opponent has already exhausted their pixels, since they will not be able to use their pixels to play a spell against you. Example: Play the spell Lightning Strike to trash a hero right after an opponent has activated the hero’s ability. The ability no longer exists, which means they’ve wasted their pixels and are short one hero. Keep track of the amount and color(s) of pixels the blue player has. Sometimes its better not to play certain spells, as the blue player can gain it later in the game and use it against you…over and over. If you are the yellow or blue player, it may be beneficial to trash your Sword or Shield early on if there aren’t any green or red monsters on the board. The Sword and Shield are only useful if you have the pixels available to play their abilities. It’s recommended that players do not purchase more than 6 heroes during a game. More often than not, you are only drawing 5 cards per turn. The smaller your deck the more often you’ll have your Leader or artifact cards show up. Do not purchase an abundance of Silver or Gold. There are 12 Silver in the game. The best option is to purchase 2 silver and a gold. Once you have a couple yellow pixels, it is much easier to buy expensive cards. 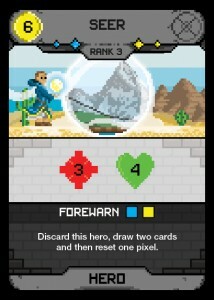 The counter to this is the Blacksmith, as he upgrades treasure cards to the next rank. Buying too many artifacts often leads to losing the game. It’s recommend that players do not purchase more than 2 artifacts during a game. Artifacts do not provide damage and health, which is needed to defeat monsters. 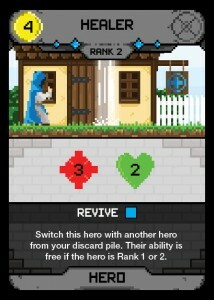 The Healer (Rank 2 blue hero) allows you to switch the card with a discarded hero. If the discarded hero is a rank 1 or 2, their ability is free. Since abilities can be played at any time during your turn, you can purchase a hero (ex. Blacksmith) during your turn. Purchased cards are added to your discard pile. Then, activate the Healer’s ability to switch it out with the Blacksmith and immediately gain the Blacksmith’s ability. The Healer is great to use with rank 2 heroes that have 1/4 or 4/1 damage and health, as their abilities can be played during any action. The Healer is also great to have with Rank 1 heroes. As they tend to have strong abilities but weak numbers. 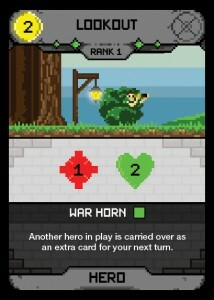 If you have two Lookouts (Rank 1 green hero), they can carry each other over as extra cards for the rest of the game until stronger heroes show up in your hand that you’d rather carry over for a better hand. The Lookout is a stronger version of the Shield (add an extra card to your next hand). The Lookout will let you carry an Elite Guard or any other hero, as opposed to having a random card show up in your next hand. The Seer works well if you have a limited amount of pixels. If you had 2 Shape Shifters in play, use a green pixel to activate 1 Shape Shifter, then activate the Seer’s ability: Discard this hero, draw two cards and then reset one pixel. You can then reset the green pixel to activate the other Shape Shifter. Another option is, after defeating a monster, activate the Seer to reset the pixel you just gained from the monster. You could reset a green pixel for the Shield, a yellow pixel for the Blacksmith, or reset a red pixel to use on a spell later.